I had the privilege to visit Shuang Hor's Lingzhi Biotechnology Park and Yung Kien Factory recently. Dr Chen Deng-Hai very kindly showed us around, and further obliged us with a 2-hour Q&A session, where many questions were asked. We acquired a lot of new knowledge on how to use Lingzhi to handle many diseases such as hepatitis, thalassemia, stroke, psoriasis, TB, cancer, blood clot, epilepsy and so on. 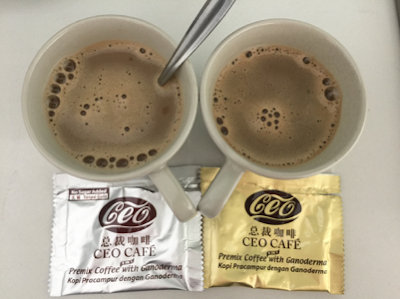 Dr Chen is a highly qualified doctor in the area of Lingzhi / Ganoderma research as he holds a Master degree and PhD degree in Organic Chemistry. He also holds many positions, including Vice President of the Department of Bio-tech and Medical Development, General Manager of Biotechnology Park and Director of Microbiological Research Foundation. He has also published many research reports. I share below some of the newfound knowledge I learnt and do my best to convey the information as accurately as I can (taken from my recordings and notes). The HBV (hepatitis B virus) and HCV virus reside inside the liver cells. If the host (patient) has low immune system and therefore can't protect the liver cells, the virus will eat the liver cells and develop and generate more virus. A clean liver cell has a lifespan of about 1 year. If a virus infects that clean liver cell, this infected liver cell will still live up to 1 year. If in this 1 year, this infected cell can't be eliminated by our immune cells, then it will generate more virus. (a) It helps newborn liver cells to generate faster i.e. can grow more new liver cells at a faster rate to replace those killed by the virus. (b) As the immune system becomes stronger, they can protect the clean liver cells from virus damage. (c) Immune cells can recognise infected cells and kill them to prevent further spreading of the virus. So during this period of taking Lingzhi and Lingzhi is doing its job of helping the immune cells kill the infected liver cells, the GPT and GOT level will go higher, as the infected cells are our liver cells and when the liver cells are being killed by immune cells, it generates more GPT and GOT. So for some patients who take Lingzhi to protect their liver, sometimes the GOT and GPT go higher during this transition period. Don't worry, it's a good sign, It means the immune cells are doing their job to kill the infected ones. If this patient takes Lingzhi for 1 year, in theory, there will be no more infected cells. But in reality, our immune system is like a wave/cycle, sometimes stronger, sometimes lower, due to our lifestyle or negative emotions like feeling depressed. If the patient wants to take Lingzhi to kill the HBV or HCV, he needs to take for at least 1 year. Take 16 capsules Yung Kien Ganoderma (YK1), up to 20 YK1 a day. The higher the dosage, the shorter the cure period. In reality, there's no drugs that can kill HBV and HCV. But based on Dr Chen's experience, there's data to show there are more 20 persons who have been cured from HBV and HCV after taking Lingzhi. The good news is they will not be infected again for the rest of their lives. Dr Chen says there is no hope with western medication - the person will still be a hepatitis virus carrier. But if he takes high dosage of Lingzhi for long-term, there is hope he will become "clean".